The Martin Bariatric wheelchair is ideal for obese users. It is strongly constructed and offers a high degree of comfort to larger users. As you'd expect from a wheelchair of this quality, the detachable footrests swing away, the armrests flip back, and the backrest can be folded. The frame is as compact as possible whilst still allowing a wide, comfortable seat (available in 20 or 22" seat sizes), and the extra-wide castors are designed to meet the demands of heavy use. It is CE marked and has been crashed tested to ISO 7179-19/1 standard. 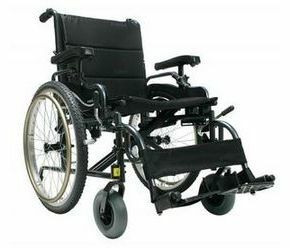 The Martin Heavy Duty is a quality option for anyone in the market for a self-propel bariatric wheelchair. Overall width of the 20" seat width is 72cm (28 1/3") - Overall width of the 22" seat width is 30"